In Part 1, I speculated that wars and other acts of bloodshed can sometimes be interpreted as a kind of atonement for sin. All sins have both spiritual and physical consequences. Although Jesus Christ’s atonement can pay for the spiritual consequence of our sins, the physical consequences must be paid by the victims, perpetrators, or others who inherit the curses of those sins. This post examines the doctrinal implications of this kind of atonement and then discusses it’s poetic, rather than legalistic nature. Punished for our OWN sins, not Adam’s transgression. The 2nd Article of Faith states: We believe mankind will be punished for their own sins, and not for Adam’s transgression. Does my theory about blood atonement fit with this doctrine? I believe this scripture is speaking about eternal, post-mortal punishment, not the natural mortal consequences of sin. True, we will not be held accountable at the Last Judgement for Adam’s transgression. However, the reality is that we still suffer in this life because of Adam’s transgression. Adam’s transgression brought death into the world, and we all die. The true spirit of this article of faith is that “we won’t be held guilty for Adam’s sin.” We can be guiltless, but we may still have to pay the price for another’s sin. Jesus was punished for our sins, but He was not guilty of them. Although it doesn’t seem fair that we are punished for the sins of others, that is the nature of mortal life. Accounts will eventually be settled with complete justice in the next life. But in this life, sins are sown and consequences are suffered across the generations in horrifically unfair ways. In the Book of Mormon, a group of Lamanites, who were once wicked and murderous, become converted to the gospel of Jesus Christ and bury their weapons of war. They separate themselves from the Lamanites and become Anti-Nephi-Lehis. The Lamanites become angry towards their former brethren. So they take up their weapons and attack the Anti-Nephi-Lehis. To their surprise, the Anti-Nephi-Lehis do not fight back, but instead kneel down and allow themselves to die at their hands. After a great slaughter, many of the Lamanites are smitten in their hearts, and feel terribly guilty for the massacre. They kneel down and ask for forgiveness, and decide to join the Anti-Nephi-Lehis, and bury their weapons as well. In the end, more new Lamanites are converted and join the Anti-Nephi-Lehis than the number that were killed. In this story, a culture of murder and violence is suddenly transformed into a culture of pacifism and humility. The Lamanites and their ancestors are guilty of many sins. But the act of shedding the innocent blood of their brethren causes a powerful change within their hearts. A similar phenomenon happens on a smaller small in Addiction Recovery. Often, it is not until a person has hit rock bottom that they finally seek help and become converted to a new way of life. As in the metaphor of the evil tree, sometimes, the sin has to ripen unto destruction before it will finally be cut down. 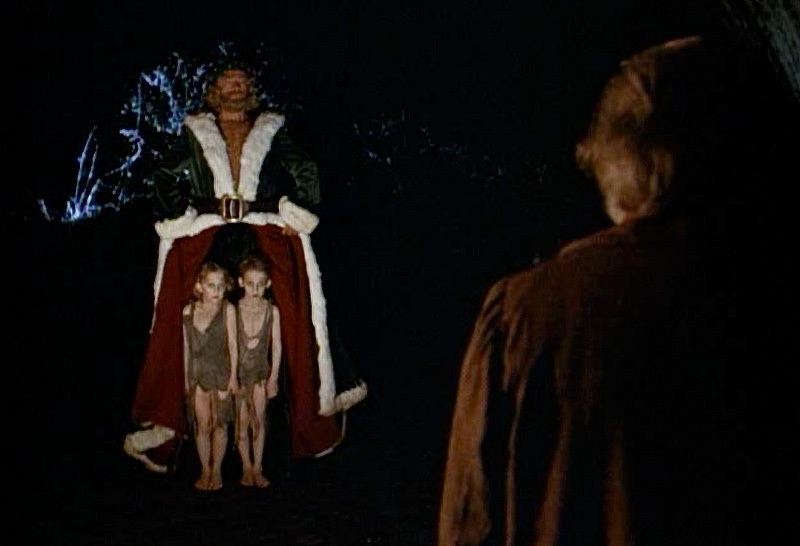 Another example of the poetic justice of blood atonement comes from Charles Dicken’s A Christmas Carol: In the story, the Ghost of Christmas Present opens his robe and reveals two starving children. He tells Scrooge, “These are your children…their names are “Ignorance” and “Want.” These children are not in and of themselves responsible for their suffering, but they fill an important prophetic role: they represent the fruits of wickedness. They pay the physical price for Scrooge’s sins here on earth. England’s current democratic and socialist state of child protections and economic safety nets are the result of millions of these little children who gave their lives during Scrooge’s Industrial Revolution. Once there had been enough destruction, the tide turned against Social Darwinism towards a healthier mixture of capitalism and democratic socialism. While animal sacrifice has no legal saving power in the gospel, it also existed as a powerful metaphor during Old Testament times. Killing something, whether it be an animal or a human, is a very deep and heavy thing. Animal sacrifice serves as a reminder that there are real physical consequences to sin that must be paid for in blood. You’d probably think twice about sinning if it meant you had to sacrifice your best lamb. LDS history has a lot of fascinating issues with blood atonement and animal sacrifice. There is the JST translation about how people believed Abel’s blood was a sacrifice for sin in the book of Genesis. Then there was Brigham Young’s teaching that the real shedding of blood must be the atonement for the sin of shedding blood, which is still the reason why Utah is the only state with execution by firing squad. And I believe Joseph Smith speculated that in the future the “sons of Levi will offer up an offering in righteousness,” and that this will be an animal sacrifice. All this goes to show that Joseph Smith and Brigham Young thought a lot about the atonement in some unconventional ways, which reflect some very deep truths about the nature of sin.